If you've ever been to Fogo de Chão in Center City, you're no doubt familiar with the delicious Brazilian cheese bread known as pão de queijo. (Can't say I ever used two tildes in a lead sentence before now.) At Whole Foods, you can find StarBites' version of the bread in convenient appetizer portions, as I wrote on Tuesday. At the crossroads of 18th and Sansom streets in Center City Philadelphia, two restaurants offer gluten-free options. Stephen Starr's new English pub, The Dandelion (124 S. 18th Street, 215-558-2500), has a menu annotated with gluten-free choices, while wine-and-cheese cafe Tria (123 S. 18th Street, 215-972-TRIA; also at 1137 Spruce Street, 215-629-9200) serves its cheeses with gluten-free crackers upon request. Many salads there are gluten free, as is the flourless chocolate espresso cake for dessert. Across the street from Christiana Hospital, Potstickers Asian Grill in Newark (1247 Churchmans Road, 302-731-0188) has added a gluten-free menu with appetizers, salads, entrees, vegetables, fried rice and noodle dishes. McCormick & Schmick's, the national seafood chain with local spots in Philadelphia (1 S. Broad St., 215-568-6888), Cherry Hill (941 Haddonfield Rd., 856-317-1711) and Atlantic City (777 Harrah's Blvd., 609-441-5579), can accommodate gluten-free diners. Thanks to reader Alicia C. for the tip. LongHorn Steakhouse has opened in Cherry Hill (2301 Route 38, 856-482-2393) at the site of a former Buca Di Beppo location. The chain recently revised its gluten-free menu, adding rainbow trout as a selection. Just down the road, Elevation Burger's third area location is now open at Moorestown Mall (400 Route 38, 888-291-4620). The patties and fries are gluten free. The Bards Irish pub in Center City (2013 Walnut Street, 215-569-9585) now serves - but, of course - Bard's beer. Fox Chase's Hop Angel Brauhaus (7880 Oxford Avenue, 215-437-1939) currently has Redbridge. My Dad's Cookies, which I raved about in my review in December, are on sale (20 percent off) today through Sunday at BRE Bakery in Warminster. Next month, Glutenfreeda Foods will introduce its newest product, single-serve pizza wraps, in three varieties: Three Cheese, Sausage & Cheese and Pesto Chicken. Each package will retail for between $3.39 and $3.59. In addition, the company is adding a shredded beef version to its microwaveable burrito line. Did you know that Irish potatoes are neither Irish nor potatoes? Of course you did. But were you aware that the candy has its roots (bad pun, I know) in Philadelphia? The confections, made of a coconut cream center that's rolled in cinnamon, show up every year around this time to commemorate St. Patrick's Day. The biggest purveyor of Irish potatoes is Oh Ryan's of Boothwyn, and their version of the candy is gluten free. The treats can be found through March at area markets such as Acme, Giant, SuperFresh, Pathmark and at BJ's Wholesale stores. Bethann also let me know that Sesame Day Camp in Blue Bell, for children ages 3 to 7, is able to serve campers gluten-free meal.The camp has sessions this summer running from four to eight weeks. The Raising Our Celiac Kids Bucks/Montgomery chapter has scheduled a bowling party on Sunday, March 13, from noon to 2 p.m. at Thunderbird Lanes in Warminster (1475 West Street Road, 215-674-8250). Families should bring a gluten-free dish to contribute to the potluck lunch. (Drinks must be purchased through Thunderbird Lanes.) The cost per lane, which includes two hours of bowling and shoe rental for up to six people, is $50; parties of less than six may be able to share a lane (and the cost) with others. RSVP by Tuesday, March 1 with the number of attendees and childrens' ages by calling Holly and Steve Staugaitis at 267-664-6425. Sunday, March 27 is the date of this year's Pediatric Celiac Disease Education Day at the Children's Hospital of Philadelphia. The free, family-friendly event will take place from 9 a.m. to 2 p.m. at CHOP's Abramson Research Building (34th Street and Civic Center Boulevard), and parking will be provided. There will be speakers (including yours truly), kids' activities, vendors and lots of gluten-free food, including lunch. Space is limited; register by calling 267-426-6822. Deal-a-day sites like Groupon and Living Social occasionally have discounts for meals at gluten-free-friendly restaurants. The new Gluten Free Deals site, however, focuses exclusively on offers for a gluten-free audience. Beginning next Monday, February 28, the site will officially launch with the first of five consecutive weekly deals. There's no charge to sign up, and you'll receive an email whenever a new deal is announced. If you enroll through any of the Gluten Free Deals links on this site and later buy an offer, you'll be supporting Gluten Free Philly, which receives a small portion of the purchase price. Finally this week, you can watch Comcast SportsNet's recent interview with Phillies outfielder Raúl Ibáñez, who recently was diagnosed with a gluten (and dairy) allergy and has since switched to a gluten-free diet. Have a great weekend! 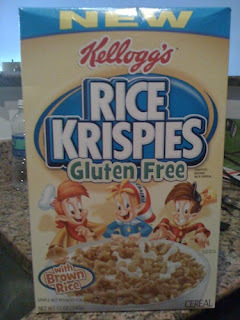 I should know this.. but for the Rice Krispies, why would they need to switch to Brown Rice? Isnt white rice GF?! Also, thanks for the link on Raul.. interesting. Hop Angel also has a gluten free menu. The food there is tasty, too!